In the year 2007, the foundation of ROOTS ENVIRO SYSTEMS was laid down. Since then, the company has never looked back. Under the able guidance of the honourable Director, with the help of dedication and brilliance of its team has emerged as a leader in the market of air management systems and equipments. ROOTS ENVIRO SYSTEMS, an ISO 9001-2008 certified company, has always responded to the need of the time. It is a well known name in air management systems providers. The company adopted a deep insight into design and selection of various air management systems and equipments with a broad vision to provide high quality products and optimum level of customer satisfaction. Incorporated in 2007, ROOTS ENVIRO has developed world class manufacturing facilities at Kolkata (West Bengal). Its plant is spread over an area of 1,50,000 sq. ft. & is equipped with plant and machinery with the latest technology to produce consistently high quality, cost effective and energy efficient air management systems to cater the multiple needs of customers. 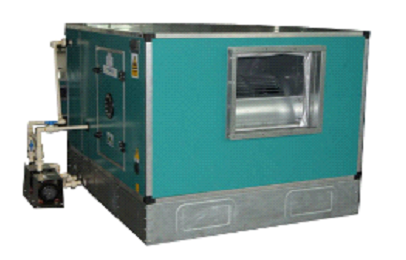 We produce our Air Handling Unit as per international norms. As per IS standards. Best engineering practices are routinely adopted. We are one of the Limited Capable Vendors in the country to take up the aforesaid jobs of big projects in India & abroad. We are extremely keen to be associated with your organization and request you to kindly register us as a prospective vendor for the above stated systems. We shall be honored to receive your specific enquiries and assure you of prompt & personalized attention all the times. We take this opportunity to introduce ourselves, M/S. Roots Enviro Systems Pvt. Ltd. 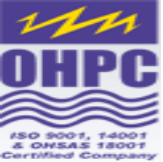 The company was founded in the year 2007, as an unit to cater the requirements of industry for a better environment in the working area and safeguard the working force by providing pollution free environment and working comfort. The company is into turnkey contracting for Industrial Ventilation and Pollution control fields as well. The company has its offices at Kolkata and Noida and at different sites, as required. The Managing Director of the company has a vast experience of 40 years in the field of industrial ventilation and A/C Systems and executed successfully innumerable major projects during his service carrier all over India. M/s. Roots Enviro Systems Pvt. Ltd. has entered in a Joint agreement with M/S. THOLANDER Ablufttechnik Gmbh, Germany to solve Air pollution Control problems i.e. Odour, Inorganic acids, Solvents, Poisonous Gases, Dust, Organic Sulpher Compounds, Hydrogen Sulphide, Aerosoles, Ammonia and solid west management systems. M/s. Roots Enviro Systems Pvt. Ltd. has entered in a Technical agreement with M/S. Enviroflo Engineering Ltd., U.K. , one of the leading dust control engineers in U.K. and also leaders in Dust foam suppression systems all over the world. The Scope of Air Handling Equipments & Systems, Bio-filter, Cross flow Scrubber, Counter Current Scrubber, Active Carbon Absorber, Ionizing Scrubber, Waste Gas Collection, Ozone Treatment and Solid Waste Management in the Indian Industry is tremendous as overall awakening towards people worthy environmental atmosphere in the Industry proved to be very useful for better productivity, health of the workmen and life of the machine. Therefore, the company came up with dedicated services to its customers who were quite satisfied with its optimum design and competitive pricing. It is the privilege of the company that right from the inception, customers of high repute to whom cost was not the matter but a perfect system with good performance was the question opted for the company, and it could provide it all to its valued customers. The aim of our company is not to accumulate money but to serve the industry in the most economical way by providing better Engineering Services, Better Standard of Equipments and Performances through updated Technologies and Management Principles. We have opened our office in NOIDA and it will look after the operation in the areas of their respective strength. » Industrial Ventilation, Air cooling & A/C. Systems. »	Pollution Control systems, Solid Waste Management. »	Bio filter, Cross flow Scrubber, Counter Current Scrubber, Active Carbon Absorber, Ionizing Scrubber, Waste Gas Collection, Ozone Treatment etc. »	Annual maintenance and operation contracts in above areas. » Consulting, Design, Supply, Installation, Hardware and Software Planning, Maintenance, Project Management. »	Manufacture of Industrial Ventilation & Pollution Control Equipment. »	Project Execution related to Industrial Ventilation, Air-cooling, A/C. Systems & Air Pollution Control Systems. 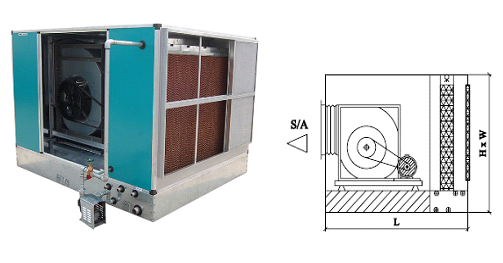 »	Manufacturer of components such as centrifugal fans, filters, grilles etc. »	Annual Maintenance Contracts for Air-cooling, Air-conditioning & Pollution Control Equipment. »	Modifications in ducts and piping. 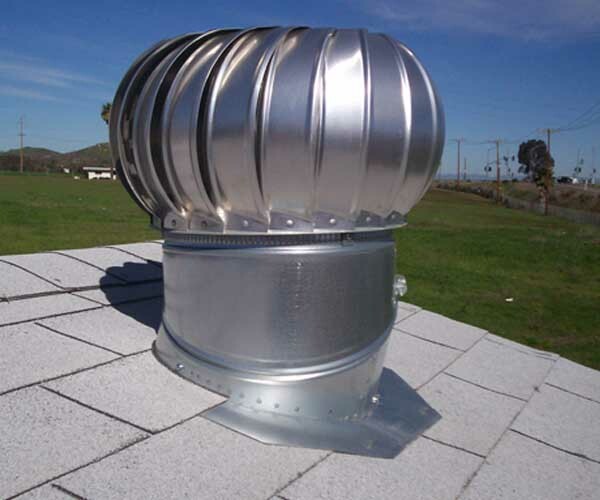 Roots Enviro efﬁcient wind driven turbine ventilators exhaust hot and stale air at a given number of air change per hour for the building, warehouse & workshops. Application : Workshops, Warehouse, Building. Range: 600 mm to 900 mm. 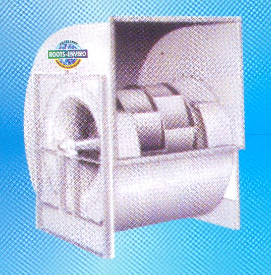 Roots Enviro Centrifugal Fans are available in single inlet single width (SlSW) and double inlet double width (DIDW) design with forward & backward curved, straight, radial or flat backward sloped bladed impeller are highly efficient and are statically and dynamically balanced with low noise level for low, medium and high pressure application. Application : ID, FD, General Ventilation, etc. Capacity : 200 CMH to 2,70,000 CMH upto 2000 MMWG static pressure. Roots Enviro Axial Flow Fans are available in wall mounting / tubular casing design with cast alloy aluminum impellers having ﬁxed or variable pitch angle arrow dynamic blade for direct / V-belt driven arrangement .These high energy efficient fans with static and dynamically balanced impellers ensure low power rating and are ideal for ventilation, fume extraction & exhaust systems. Application : Power house building, Turbine hall, workshop. Air linear bar grills are designed mainly for sidewall, cealing, floor and sill application. 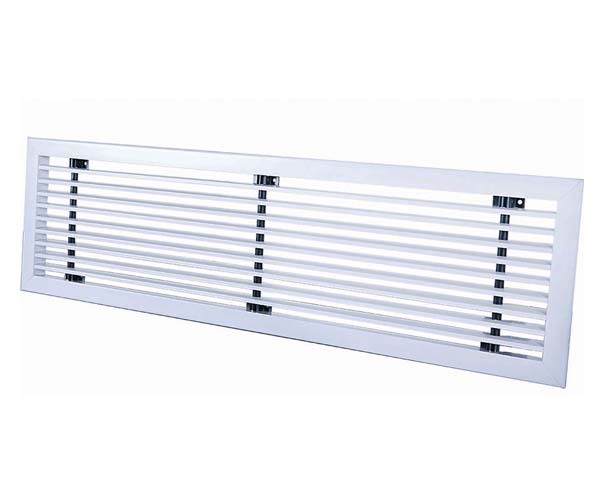 Linear bar grills assembled from extruded profiles for supply and return air flow. The bars are assembled to assure rigidity and maintain straight lines. Horizontal bars on the front and vertical bars on the rear and standard dampers ar provided for control of air flow. It can be choosen from 0°, 15° Two way, 30° one way 45° one way deflections. 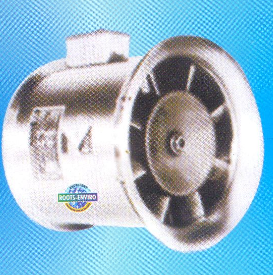 Air supply and return air grills are made by high quality extrude aluminium profile. Air supply air grills come with individual adjustment front horizontal and rear vertical or front vertical and rear horizontal louvers. 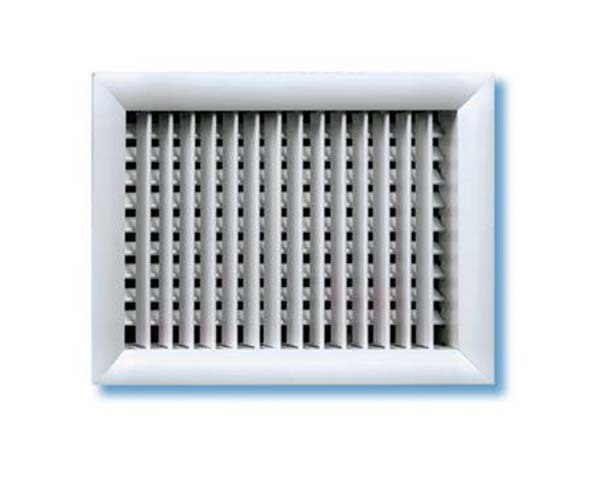 Air return air grills come with horizontal or vertical adjustable louvers. 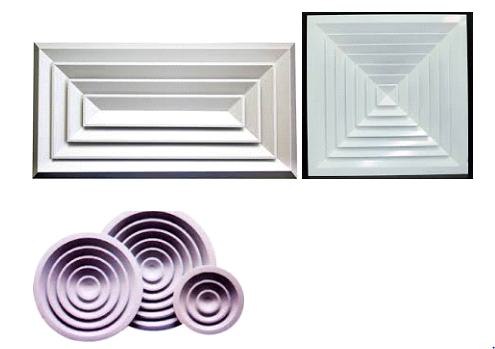 Air Control louvers are designed for fresh air intake application. The louver blades are riveted to the main frame by suitable 'L' section. 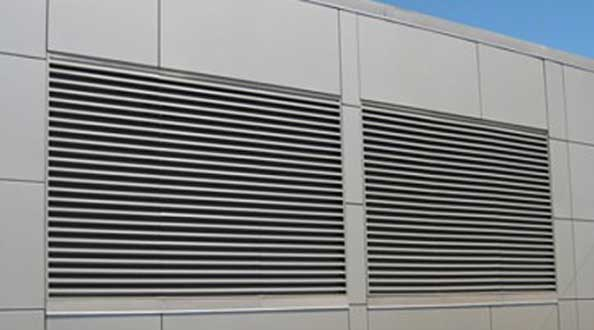 Air Control louvers and dampers constructed from GSS / MS / extruded aluminium profiles. 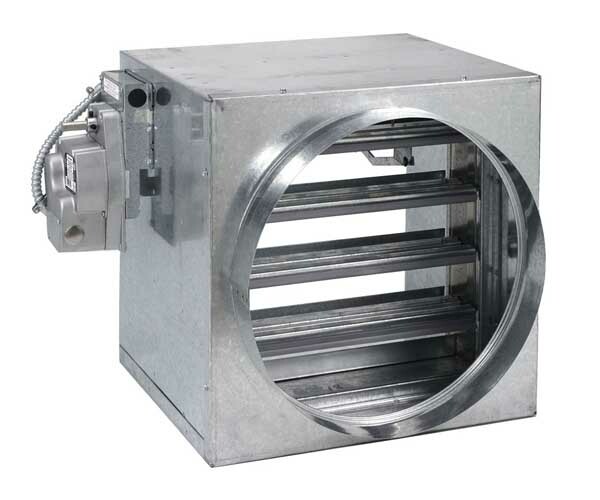 Volume control dampers has been speciﬁcally designed to provide positive air control in the ducted HVAC systems. These dampers are available in G.I / Aluminium construction. The blade linkage mechanism is fully enclosed with all operating gear out of ducted airway. Dampers have opposed blade operation and are suitable for many control options. Grill damper has been designed to ensure proper regulation of air. The dampers are designed with nylon bushes for efficient, smooth and quiet operation and to avoid rattling noise. Opening mechanism like screw, cam or handle type are available. Standard sizes are also available. However specific sizes can also be provided by us as per customers’ applications. Other powder coating ﬁnishes are available on request. In applications where the air discharge from diffuser has to travel very large distance (viz. shopping malls, Higher ceiling assembly halls) Spot Diffusers or Jet Nozzles are preferred. Air-direction is adjusted by swivel movement of Jet Nozzle/Spot diffusion. 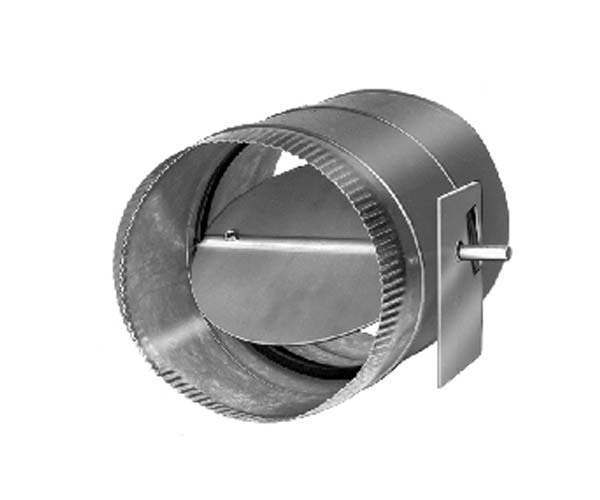 Aluminium spinnings are secured to flange which is fixed to duct collar or suitable frame. (2) Eye ball assembly smoothly rotates in fixed mounting flange-seals prevent leakage. (3) Clear anodize finish for years of corrosion-resistant performance. Epoxy polyester powder coated / Ivory / Off white. High capacity louvered face directional diffusers designed to supply large volumes of air at relatively low sound level and pressure drops. Frame is made of Aluminium / Mild – Steel duly enamel painted. 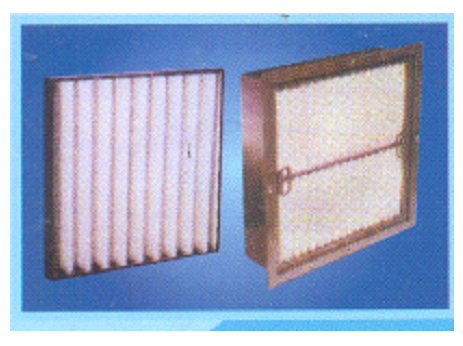 Filter element consists of high loft synthetic non – woven media supported by HDPE mesh on both side. Element is supported by spacers to ensure strength and uniform air flow. Air handling units , package unit , Air washers and General Pre – filtration. An air washer is a piece of equipment that is designed to improve air quality by scrubbing the air that moves through it and adjusting humidity levels to keep the environment consistent. Air washers are used as part of climate control and air quality systems. 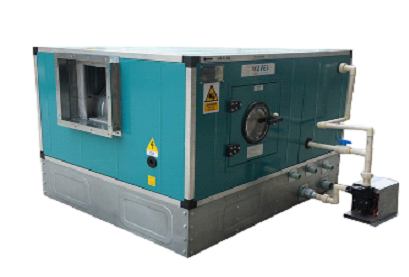 ROOTS ENVIRO SYSTEMS Pvt Ltd offers superior quality Air Washer System, Industrial Air Washer Unit Washer and that works on the principle of cooling outside air by passing it over water-saturated pads, causing the water to evaporate into it. The cool air is then directed into the required space, and pushes warmer air out through the given vents. Air Washer Unit is a very energy-efficient means of cooling. These washers have long working life and are available in modular designs. They are equipped with an anti-microbial protection system to ensure hygienically cleaned air. Our range also offers air washer and fan and blower. The air washers are highly tested and are completely reliable. This air washer is manufactured using excellent quality raw material and latest technology by our skilled professionals. In order to ensure quality, this air washer is stringently tested on various parameters by our experts. These products are widely acclaimed among the clients for long functional life, corrosion resistant and low maintenance cost. For ROOTS ENVIRO SYSTEMS, a client’s satisfaction is of utmost importance. Low installation cost, Low running/operation cost. Effective in high heat generation areas. Healthier System - Since it works on 100% fresh air. Tired of the humidity at home? Feel sweaty day in and day out? Well, it’s time for you now to invest in a good Air Washer Double Skin Type. An air washer is basically a piece of equipment that is used to improve the quality of air. It does so by scrubbing the air that moves inside it and then adjusting the humidity levels in order to keep the environment consistent. The Air Washer Double Skin Type from ROOTS ENVIRO SYSTEMS Pvt. Ltd are designed to meet your needs and also for climate control and drastically the quality of air in the environment. Multi slope S.S-304, Aluminum or G.I. drain pan which will ensure that there is proper drainage of condensate at all times. Common frame for blower and motor. Monoblock pump set 1/3 phase delivery head 6-48 Meter . To meet specific industrial need of our clients, ROOTS ENVIRO SYSTEMS Pvt Ltd. manufactures and exports a range of high quality Air Washer (Evaporative Cooling Unit) or Industrial air washers. Simply used for cleaning and cooling the warm and moist air that enters into these systems to a level where it meets dew point when come in contact with refrigerated water. These units help in minimizing the moisture content of air and making them fresh from its actual content. These products are widely demanded by the clients for their hassle free performance and durability. Besides, one can get these products at reasonable rates. 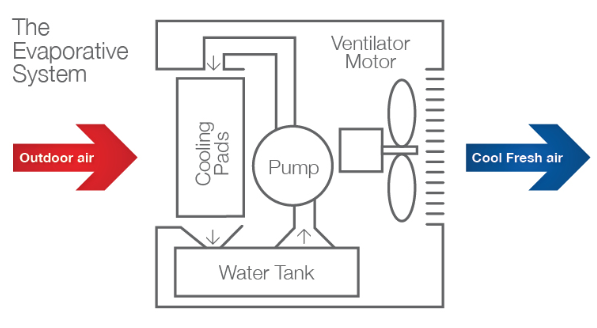 Evaporative cooling is a simple, cost-effective method for cooling indoor spaces. However, depending on the climate where you live, evaporative cooling might not be the most effective cooling option for you. In order to cement our reputation in this domain, ROOTS ENVIRO SYSTEMS Pvt. 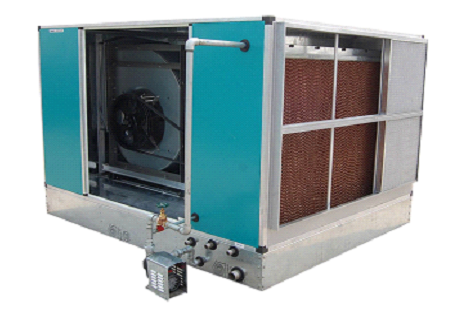 Ltd. is instrumental in manufacturing, exporting and supplying a broad range of Evaporative Cooling Unit. 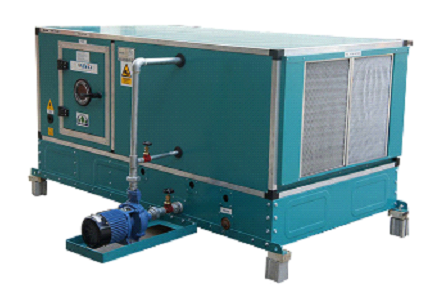 These units are currently in use in a variety of evaporative cooling applications such as generator rooms, gas turbine intakes, industrial cooling of hot spots and hot zones, comfort cooling, commercial agriculture to name a few. Our products are made using premium raw materials and latest methods of production, which assures durability and efficient performance. Highly demanded for its high quality and efficiency, this unit is available in several specifications as per the demand of our clients. These evaporative air coolers are highly appreciated by our clienteles for its excellent quality, robustness and premium functionality of providing cool air especially during hot summer season. Our evaporative air coolers are very easy to control and provide low noise and excellent energy efficiency for long lasting use. In a very hot environment, what better way to cool than use an air washer? , ROOTS ENVIRO SYSTEMS Pvt Ltd has the best option for Single Skin Air Washer. They can be used for a variety of reasons and can provide perfect and comfortable conditioning for office and home. They are suitable to be used in hotels, malls, garment units or even other factories which need constant cooling. Most engineering and industrial units also use these single skin washers. With a very rich experience in the industry, , ROOTS ENVIRO SYSTEMS Pvt Ltd. can give you the best Single Skin Air Washers at the most competitive prices in the market. Address: 26/2, Snuff Mill Street. Kolkata – 700 056. West Bengal, India. Address: Sadarhat, P.O. Karnamadavpur, Kolkata- 700 113. West Bengal. Believe in the potential of creative thinking to build your reputation. Roots Enviro Systems Private Limited is growing and we are looking for experienced, talented and ambitious professionals to join our team. If you want to work in a professional work environment with entrepreneurial spirit and limitless possibilities, then we invite you to apply for the career opportunity at Roots Enviro Systems Private Limited. We seek professionals who are team players and subscribe to a high ethical standard. High levels of motivation and persistence. Interested candidates, mail your Resume & Personal Details to "career@rootsenviro.com". Consectetri adipisicing quites officia deserunt retrianimest laborum semper justo.